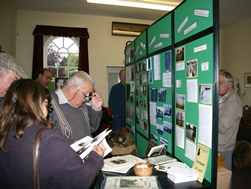 On 9th October 2010 the Recreation Room opened its doors for the 6th Open Day organised by The History Group. The theme this year was Wind, Water and Willow to celebrate Beckingham and Saundby’s rich history linked around these materials. The Old Windmill on Gringley Road was a dominant feature on the landscape but sadly this was demolished in 1954 and only the photographs and information from Peter Mason’s records remain. Today, many of the outbuildings that surround the Windmill are still standing and they have been sympathetically renovated to incorporate many of the mill features (including one of the sail beams that is built into Mill Farm). 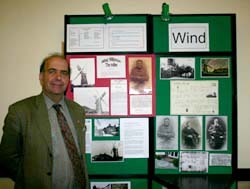 The present owner of Mill Farm who visited on the day, Ray Simpson, has lived in the property for many years and was genuinely interested in the History Group’s collection. In addition Tuxford Windmill loaned some material on the day to support this section which included freshly milled flour and muesli for sale. Another important visitor to the Open Day was Rodney Cousins who brought along his collection of basketware, tools and books. Rodney has strong links with The History Group, is very supportive of their activities and always happy to share his knowledge and expertise on the subject of Willow and Willowcraft. The Gale miniature baskets and basketware were loaned for the day from the Lincolnshire Life Museum and these are exquisite samples of the type of basketware Herbert Gale and his company used to produce in Beckingham. 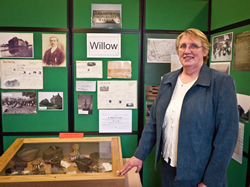 There was a display of photographs and text about the Gale Family and pictured is Barbara Newman who is a descendant of Herbert Gale and who still lives locally. There was also information on the Old Willow Works regarding the renovation of the building over the last few years. Phase Two is currently under way with a completion date of March/April 2011 – click here for more details. Beckingham has a huge link with the River Trent and its Shipyard Building industry through the Watson family and the History Group has a wealth of material from Peter Mason and other sources. 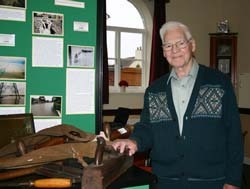 Bob Gill brought along his collection of photographs and boat building tools that had been used at the Shipyard prior to it being closed 1964, some of the photographs having never been seen before by the group and adding to their already extensive collection. As always there was a rolling slideshow put together by Albert Philipson, this year on the footage of the Aegir and floods of Beckingham. There was also the Peter Mason files and recreated webpages on file for those not able to access the website.